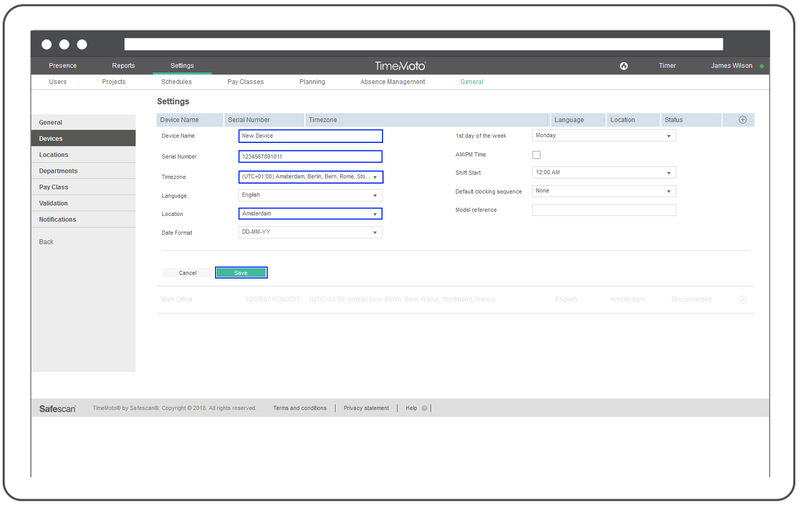 During the installation of a TimeMoto Terminal, the device will be added to your TimeMoto Cloud account. 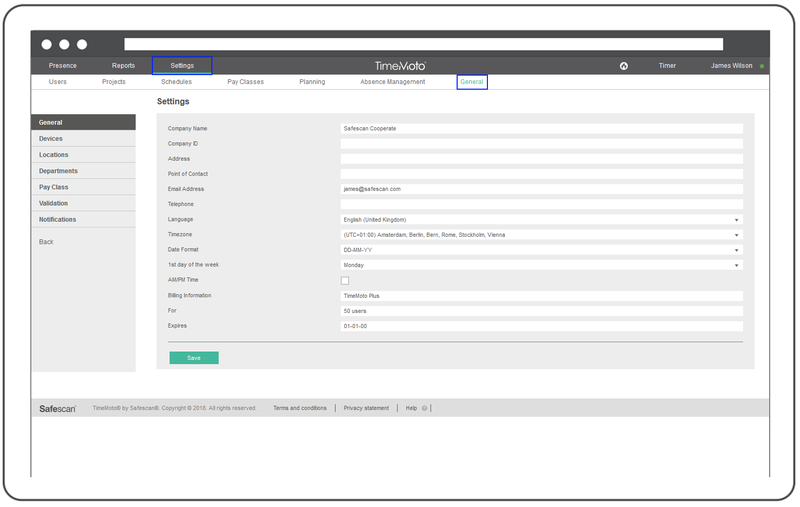 This can only be done after the initial registration of the terminal and activation of the TimeMoto Cloud service. Please log in to your TimeMoto account if you encounter any problems or wish to add the device to your account manually. Go to [Settings] and select [General]. You will see your company information. On the left, select [Devices] from the menu. Click on the [+] at the top of the far-right column of the page to add a new device. Please enter a device name, the serial number of the device (located on the back of the unit), the correct timezone and the location so the correct users will be transferred to the device (please also see our other article, User Locations and Device Locations). You can also set the internal functions of the device itself. The "Date Format" section alows you to set how the device will display the date. [1st Day of the Week] and [Shift Start] is for calculating the hours correctly to allow employees to view their clock times on the device itself. By default it is set to Monday at midnight. [Default Clocking Sequence] allows you to set a sequence of how your employees will clock on the device. By default it is set to In/Out but if you require your employees to clock for their breaks, you can change it to In/Break/Return/Out. Please Note: Multiple In and Out clockings during a working day may cause certain times to be processed as a break. 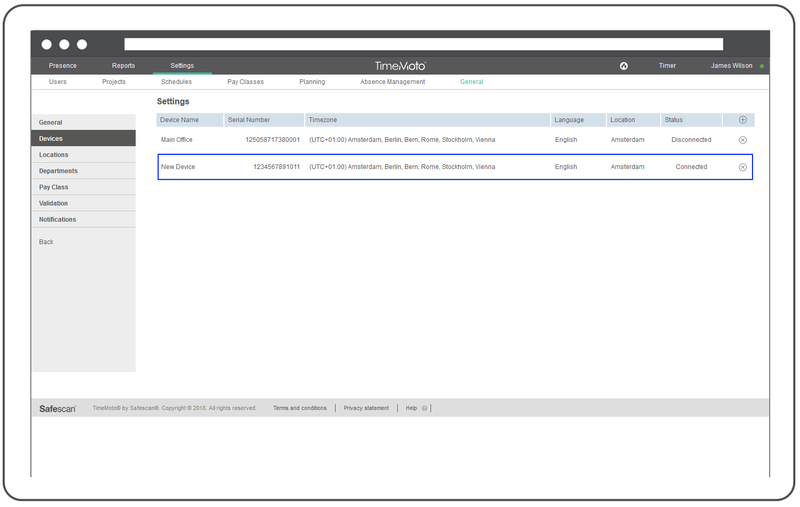 With the Break and Return function you can count the break as within the working time or exclude it (TimeMoto Cloud Plus Option). The model reference will be shown once pressing the Save button. Once you have saved your device settings, your device will be registered and will begin connecting and transferring data to and from the cloud. You will need to refresh the page to see the current connection status of your device. If your device is not connecting/connected to your TimeMoto Cloud, please see our troubleshooting article by clicking here.